Death*: Joan Marie Sullivan died on 11 January 2012 at New Bloomfield, Callaway County, Missouri, USA, at age 89. [S1529] News Tribune, January 12, 1012, www.newstribune.com/obituaries/2012, accessed April 25, 2012. [S609] Baptimal Registery, page 29, Baptimal Record: Family History Library, MF#0926131, March 29, 1872, Denn Parish. [S609] Baptimal Registery, page 29, Baptimal Record: Family History Library, MF#0926131. The date of John's baptism is six days before the registration of his birth on April 5, 1872. Confusing!, March 29, 1872, Denn Parish. [S2425] John Sullivan, Bellananagh, Cavan, County Cavan birth registration #483; page 105; Coded 02189409, Document provided by Eileen Sullivan from www.irishgenealoyg.ie, February 12, 2017 (April 20, 1872). [S2630] Eileen Sullivan, "Descendant List of Matthew Soroghan." [S2406] Eileen Sullivan, "The Sullivan's - Matthew," e-mail to Elaine Beaudoin, December 9, 2016, Included a photo of the Sullivan home in Denbawn which has now been torn down. [S2656] John Francis Soraghan, Ireland, County Cavan, Cavan, Dennbane birth registration Line 103, Provided by Eileen Sullivan, March 9, 2018 (Dec 2, 1921). [S2522] Interview, Teresa Sullivan Cahill, August 22, 2017. [S2409] The Edmonton Journal, September 27, 2011, www.connelly-mckinley.com. 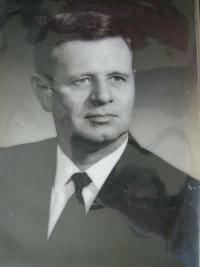 John W. Sullivan, 94, husband of the late Clarice Fitton Sullivan passed away Friday Nov. 12, 2010 in Myrtle Beach, SC. He was born in New Haven September 15, 1916 a son of the late Patrick and Elizabeth Finnagan [sic] Sullivan and had resided in Hamden and West Haven before moving to South Carolina. Mr. Sullivan was employed by the CT Transit Co. as a bus driver for 38 years prior to his retirement in 1972. He was a communicant of Our Lady of Mount Carmel Church, a member of the Knights of Columbus, New Haven, and a life long member of the V.F.W. Post #10321 of Hamden. [...] In addition to his wife he was predeceased by his son Vincent Sullivan, a sister Elizabeth McGreavy, and a brother James Sullivan. [S1676] Find A Grave, online http://findagrave.com, John W. Sullivan memorial #99210277, created by Mike Sullivan, 19 Oct 2012. Biography*: Letter to Joseph C. Sullivan written on March 12, 2003 asking him to lunch. I think I may be your first cousin once removed. My Mom, Helen Sullivan McIntyre, is the daughter of Al and Nell Sullivan and I believe she is your first cousin. I've been doing genealogy for several years and recently my Mom asked me if I had located Sr. Mary Ellen. They were both born in 1914 and she remembered growing up and visiting often with her. She even told me that Mary Collette taught her how to swim. In my effort to track down Sr. Mary Ellen, I learned she passed away in 1997. My Mom was so disappointed. She had hoped that she would be able to contact her. The Mater Dei Provincialate provided us with some information about Sr. Mary Ellen and about all the good works she did over her lifetime. The archivist remembered Sr. Mary Ellen and told me she had worked diligently at copying, cutting, and pasting the lives of thousands of deceased Daughters of Charity sisters from all over the world during her three years at Seton. She sent me some information on her and I noted in Sister Mary Ellen's obituary that two of her brothers were still alive. My Mom was 89 yesterday and I told her at lunch I would try to locate you. Using the Internet, I found your address. I'm writing in the hope that you might be willing to meet my Mom and me for lunch. As you can see from my address, I live pretty close to you. My Mom lives in the same building as I do. I'm going out-of-town next week and I will be back at the end of March. I'd like to give you a call early next week and set up a date for us to get together in April. I hope you would be willing to meet with us. The telephone number I have for you is 847-491-0281. Please do not hesitate to call or email me. [S309] US Social Security Death Index, 1935-Current, Ancestry.com. [S510] Evanston Review, 25 June 1959, p. 97. [S1643] Chicago Tribune, June 13, 1968, page B28, ProQuest, accessed July 3, 2012. [S1743] April 3, 1930 Illinois, Cook County, US Census, Washington, DC, ED 1890, page 10 A & B, Ancestry.com, accessed June 9, 2012. [S1876] Joseph R. Sullivan, "Peter James Sullivan b1893 Family Group Sheet", Printed from genealogy database. [S1761] Chicago Daily News, January 3, 1944, page 25. Death*: He died on 2 January 1962 at Chicago, Cook County, Illinois, USA, at age 84. Joseph V. Sullivan, 83, of 3173 N. Sheridan rd., died yesterday in his home. Mr. Sullivan retired as executive assistant to the chairman of the chicago Transit authority in 1948, after 44 years of service. Surviving are a son, George F; a daughter, Mrs. Dorothy Gerding; four grandchildren; two great-grandchildren; a brother, and a sister. Mass will be said at 10:30 a.m. tomorrow in Our Lady of Mount Carmel church 690 Belmont av. Joseph V. Sullivan of the Belmont Hotel, 3172 N. Sheridan Rd., fond husband of the late Edna Nacey Sullivan, dear father of George F. Sullivan and Dorothy Gerding, grandfather of 4, great-grandfather of 2, brother of Andrew W. Sullivan and Mrs. Albert E. Graser. Funeral Thursday, 10 a.m. from Hursen Chapel, 929 Belmont Ave. to Our Landy of Mt. Carmel Church. Mass 10:30 a.m. Interment Calvary. Omit flowers, please. [S2736] Joseph R. Sullivan, "Photo," e-mail to Elaine M. Beaudoin, January 13, 2019. [S495] 1900 US Census, Illinois, Cook County, Chicago, Washington, DC, ED 719, sheet 9, line 99. [S1710] Chicago Tribune, January 3, 1962, B10, ProQuest, accessed January 30, 2013. [S594] Donald Joseph Sullivan, Illinois certificate and record of death, Family History Library, MF# 1239971. [S1524] Sullivan-Pomeroy Marriage license no. 40752: FamilySearch.org, accessed April 12, 2012. [S1522] George Francis Sullivan, Birth Certificate No. 15589, FamilySearch.org, accessed April 12, 2012 (February 4, 1907). [S1521] 1920 US Census, Illinois, Cook County, Chicago, Washington, DC, ED 1425, page 6B, Ancestry.com, accessed April 12, 2012. [S595] Owen W. Sullivan, Illinois certificate of death, Family History Library, MF# 1877159. [S1712] Joseph R. Sullivan, "Joseph V. Sullivan Family Group Sheet", Sheet includes assorted information on Joseph Vincent Sullivan. [S1523] 1930 US Census, Illinois, Cook County, Chicago, Washington, DC, ED 1731, page 1B, Ancestry.com, accessed April 12, 2012. [S2527] Catherine Sullivan, Ireland, Cavan, Ballinanagh, Denbawn Page 105; #02297944, Accessed September 9, 2017 on irishgenealogy.ie (May 19, 1866). Death*: Katherine died on 30 March 1928 at Evanston, Cook County, Illinois, USA, at age 7. Sullivan - Katherine Frances Sullivan, daughter of Mr. and Mrs. Philip Sullivan (nee Mahoney). Sister of Thomas, Mary, Collette, Agnes, Philip Jr., and Rita Ann. Funeral Monday at 9:30 a.m. from parent's residence 1034 Foster St., Evanston to St. Mary's Church. Burial at Calvary. Chicago Daily News, March 30, 1928, page 62. Katherine Frances Sullivan, seven year old daughter of Mr. and Mrs. Phillip Sullivan of 1024 Foster street died at her home Friday morning after a two weeks' illness. Katherine had been attending St. Mary's school for a short time. Surviving are her parents, two brothers, Thomas and Phillip, and three sisters, Mary, Agnes and Rita Ann. Funeral services were held Monday at St. Mary's church with the Rev. Charles Sullivan, uncle of the child, saying mass. [S1137] Catherine Frances Sullivan, Illinois birth certificate no. 249, Family Search Record Search, accessed March 10, 2010 (May 10, 1921). [S5] James Sullivan Cemetery Record, Graves purchased 1881, Calvary Cemetery, Evanston, Cook County, Illinois, USA, N. W. Cor. 1 ft. frm N. Line.